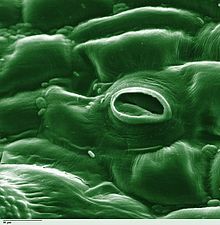 In botany, a stoma (plural "stomata"), an aa cried a stomate (plural "stomates") (frae Greek στόμα, "mooth"), is a pore, foond in the epidermis o leafs, stems, an ither organs, that facilitates gas exchynge. ↑ "Living Environment—Regents High school examination" (PDF). January 2011 Regents. NYSED. Retrieved 15 June 2013. This page wis last eeditit on 18 Februar 2018, at 00:25.